When Narendra Modi was sworn in as the Prime Minister of India on May 26, 2014, he didn’t forget to keep an ‘auspicious’ flower, sent by Swami Atmasthanandaji as his blessing, in his off-white sleeveless coat’s pocket. Kolkata: When Narendra Modi was sworn in as the Prime Minister of India on May 26, 2014, he didn’t forget to keep an ‘auspicious’ flower, sent by Swami Atmasthanandaji as his blessing, in his off-white sleeveless coat’s pocket. Swami Atmasthanandaji - President of Ramakrishna Math and Ramakrishna Mission - died on Sunday at around 5:30 pm at Ramakrishna Mission Seva Pratishthan Hospital, Kolkata. He was 98 and was admitted to Seva Pratishthan hospital on February 21, 2015, due to old-age ailments. His condition worsened over the last few days. 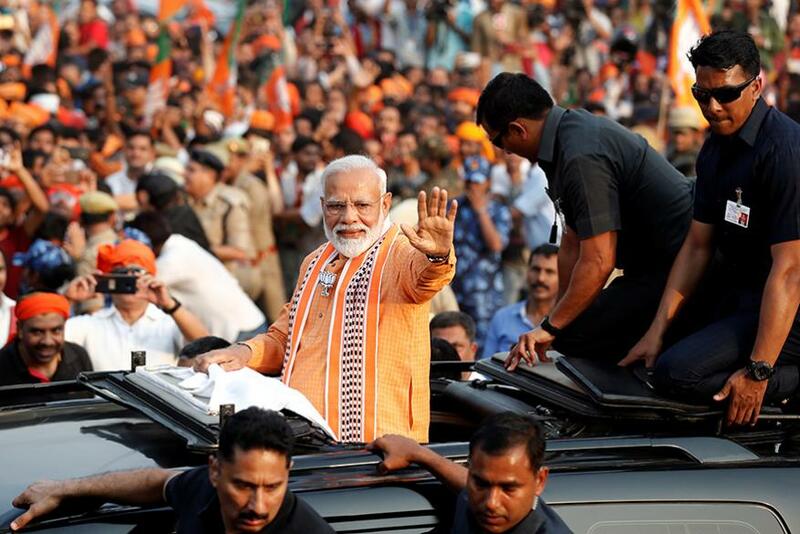 Among many, PM Modi termed his demise as a personal loss because at the age of nearly sixteen he (Narendra Modi) came to Ram Krishna Mission in Belur Math in Howrah district to become a monk. “The demise of Swami Atmasthananda Ji is a personal loss for me. I lived with him during a very important period of my life. Swami Atmasthananda ji was blessed with immense knowledge and wisdom. Generations will remember his exemplary personality. Whenever I would visit Kolkata, I would always make it a point to seek the blessings of Swami Atmasthananda Ji. As President of Ramakrishna Mission set up by Swami Vivekananda, Swami Atmasthananda ji worked tirelessly and spread its influence globally,” PM Modi's tweets read. “After giving a patient hearing to that young boy (now Prime Minister of India), Atmasthanandaji told him that he is meant for something else… to serve the people,” he said. Since then - even before becoming the Prime Minister of India - Modi holds Swami Atmasthanadji in high esteem. “Narendra Modi used to treat him as his guru. When both of them were in Rajkot, Modi used to go to him to seek guidance,” he said, recalling Swamiji fondly used to call him ‘Norendro’. Swamiji’s cremation will take place at Belur Math on Monday at around 9.30 PM. He was born in May 1919 at Sabajpur near Dhaka. He received mantra diksha from Swami Vijnananandaji Maharaj (a monastic disciple of Sri Ramakrishna) in 1938 and joined the Ramakrishna Order at Belur Math on January 3, 1941, aged 22 years. In 1945, Swami Virajanandaji Maharaj, the sixth President of the Order, gave him Brahmacharya vows, and in 1949, Sannyasa vows and the name Swami Atmasthananda. He spent several years in his holy company in the solitude of Shyamla Tal in the Himalayas. In 1952, he was posted to Ranchi TB Sanatorium branch as an Assistant Secretary. He was sent to Rangoon (Yangon) Sevashrama as its Secretary in 1958. He developed the Sevashrama hospital and it soon became the best hospital of Burma (Myanmar) at the time. When military rulers took over Rangoon Sevashrama, he returned to India in 1965. He was posted to Rajkot branch as its head in 1966. The beautiful temple of Sri Ramakrishna at Rajkot Ashrama was built during his tenure on his initiative. “During his service in Rajkot, once again Narendra Modi met him and got spiritual guidance in Gujarat,” Swami Suviranandaji said. “In 2016, Prime Minister Narendra Modi met Swami Atmasthananda Maharajji. Then, he spent nearly 10 minutes in the hospital with Maharaj and touched his feet. Both spoke in Gujarati and asked about each other's well-being during the short exchange,” he recalled.